You Save: $10.96 (73%) Ships in 1 day. Publisher: Fearless Critic Media, 2010. Soft Cover, 312 pages, 5x8. 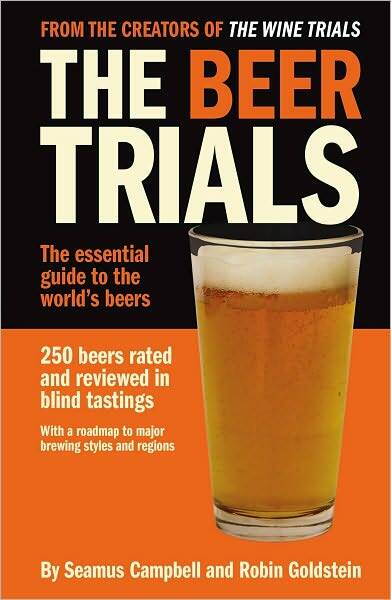 The essential guide to the world's most popular beers, The Beer Trials features brutally honest ratings, full-page reviews, and photos of the 250 most popular beers in the world, based only on brown-bag blind tasting. 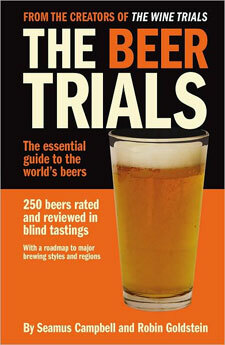 The Beer Trials also includes a complete reference to the major beer styles, flavors, and regions. From the creators of The Wine Trials, the world's bestselling guide to inexpensive wines, comes the first beer guide ever to be based on blind tastings. Robin Goldstein is author of The Wine Trials and co-author of The Wine Trials 2010 and The Beer Trials. He is a contributor to the New York Times' Freakonomics blog, and has written for more than 30 Fodor's travel guides, from Italy to Argentina to Hong Kong. He has an A.B. in neuroscience and philosophy from Harvard University, a J.D. from the Yale Law School, a certificate in cooking from the French Culinary Institute in New York City, and a WSET advanced wine and spirits certificate. Seamus Campbell is one of just 96 beer experts to have passed the rigorous Certified Cicerone exam. An experienced homebrewer, Seamus happens to share a birthday with legendary Beer Hunter Michael Jackson. He lives in Portland, Oregon, where he writes the beer blog The Daily Wort and is a contributor to the Fearless Critic Portland Restaurant Guide.